A camino is a gift of love. And this camino is special to me. 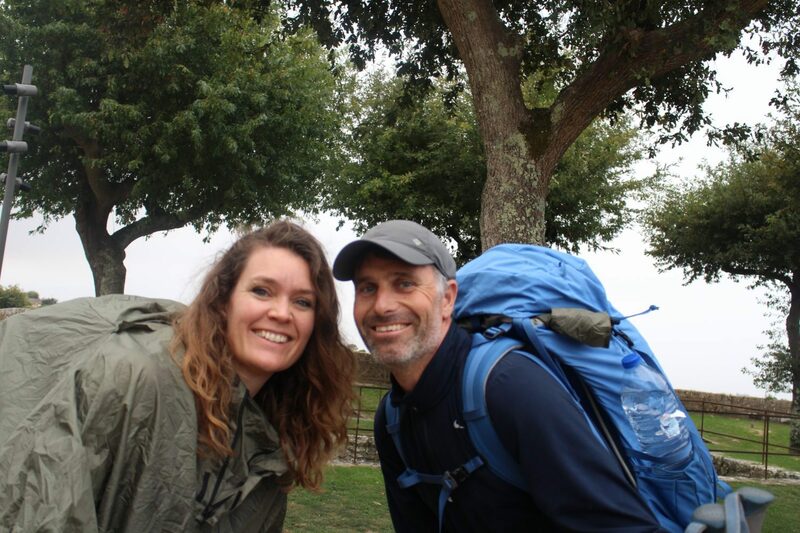 My call for walking the camino came to me 18 years ago, and it took me 17 years to take the first steps and walk my first camino with my teenaged daughter. 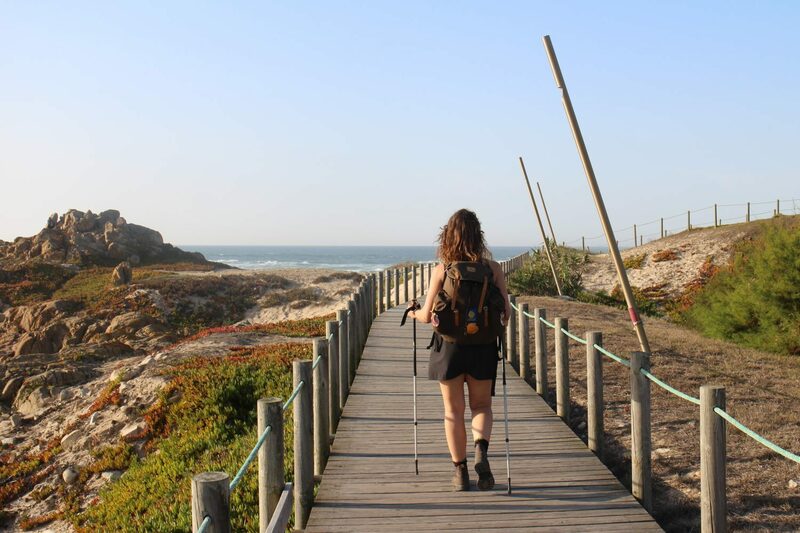 7 months later I went on a camino alone – and now I am on my third camino in just one year. I am ready to start my Camino Portuguese in the company of a very important person in my life: My husband Torben. Before venturing out together we have spent several hours of talking about the camino. 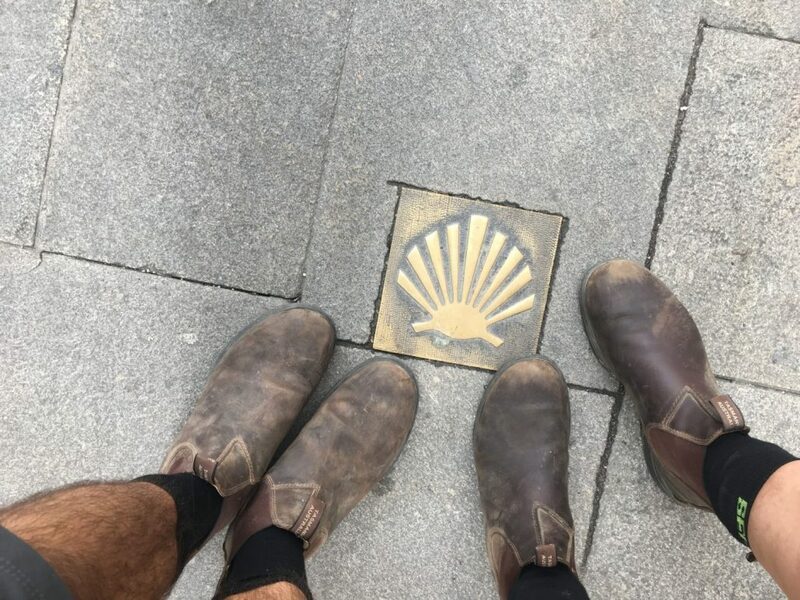 My 2 cylindered, both feet on the ground husband has asked all the skeptical questions imaginable as to what makes the camino so special? What makes it so different from all our other treks in Denmark, Italy and Mallorca? The camino will show you, I thought silently, when I ran out of answers, that would sound just a bit rational and real. 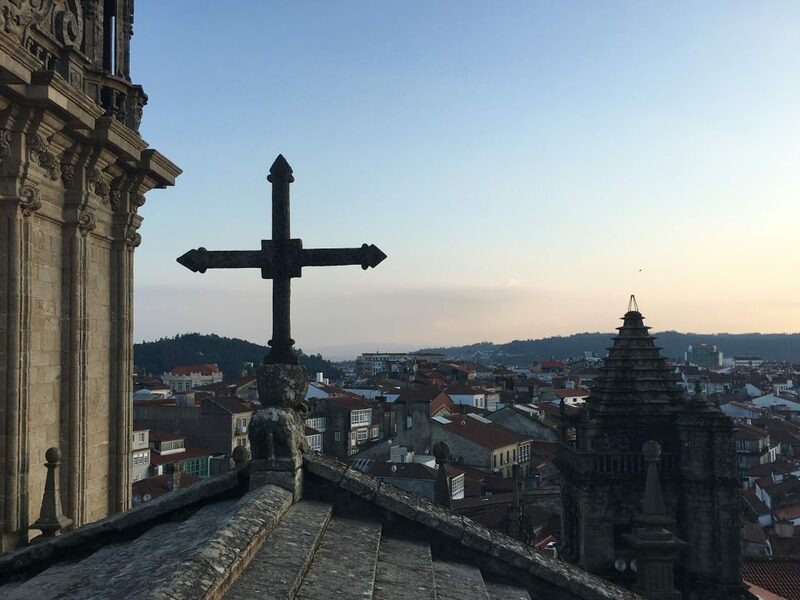 And so it does, from the first night, when we land in Porto – delayed and having missed the last metro. The hour closes in on 1.30 AM before we stand in a dark road in front of the donativo albergue. I had an agreement with the albergue that we would be arriving late – but this late? I am doubtful as I dial the number on the door. A sleepy sounding host answers and promises to be there in 10 minutes. 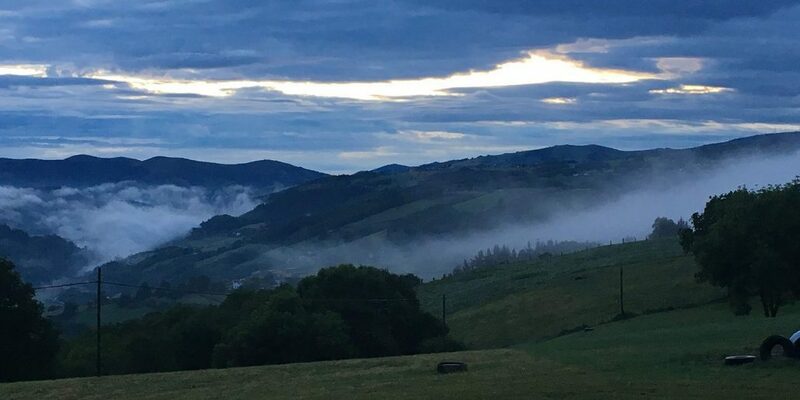 This is my husband’s first meeting with the generousness of the camino: a local man willingly and voluntarily gets up in the midst of a good night’s sleep to greet two strangers going on a pilgrimage. 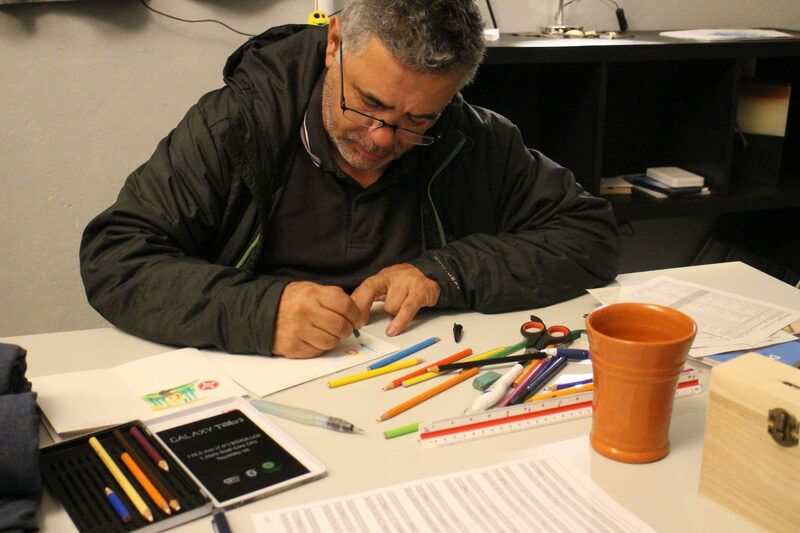 Asks us genuinely about our camino and gives us the most beautiful stamp ever: a hand painted stamp in our credential drawn with stable and patient strokes. I fall asleep excited and convinced that the camino will win Torben’s heart. Completely unprepared for Porto’s beauty, time flies on our first day, as we slowly walk around for 5 hours in the small streets taking in all the houses decorated with ceramic tiles. Suddenly it is 1PM before we embark on our way out of the city via a detour described by John Brierley along Rio Douro. 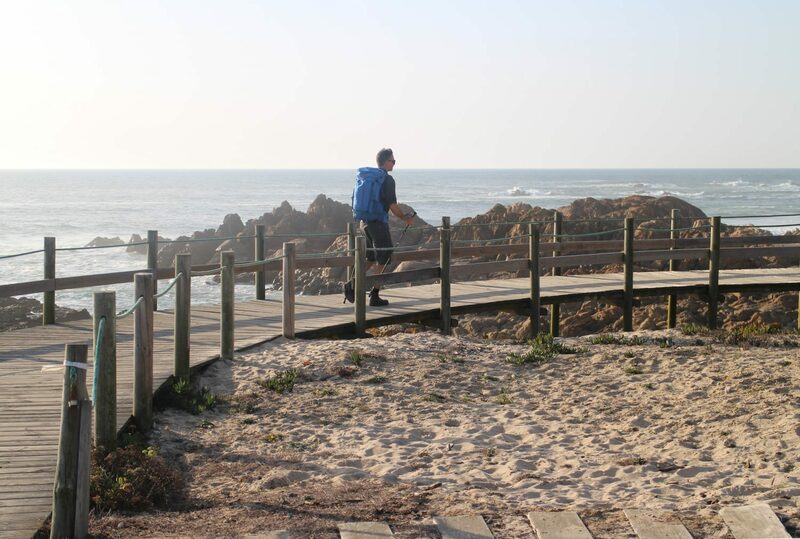 The plan is to walk a short route of 10 kms ending up in Matosinhos where we want to sleep. Torben had to buy new shoes a week before our trip, as his beloved trekking shoes needed to be restored big time. It is no walk in the park – far from – the sun bakes down on us and a stiff wind greets us when we reach the coast of the Atlantic ocean. We are quite ready to call it a day when we get to Matosinhos at 4 PM but there are no albergues around, only a fully booked hostel. On top of that the cheapest hotel costs EUR 254 for a double room. 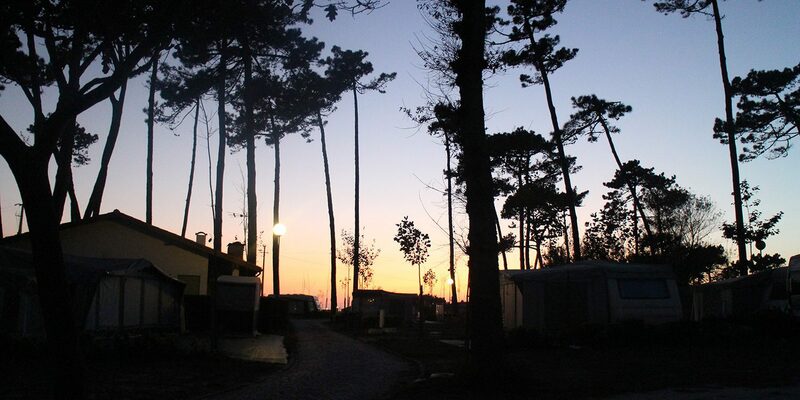 A very helpful woman at the tourist office tells us that the closest place to sleep for pilgrims is Camping Orbitur in Angerias a further 12 km walk. 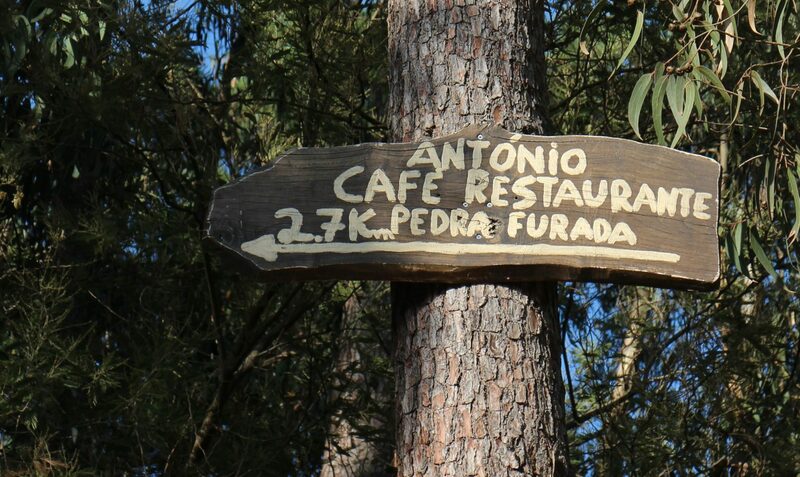 I have read about that place but was quite sure that camping and camino doesn’t go hand in hand for me. I love nature and outdoor recreation, but I just don’t understand the principle of camping. Well, you have one opinion until you get yourself another one – especially after you double your walking distance. Boardwalk upon boardwalk await us as far as our eyes (and patience) can see. We talk about expectations: and how having too firm expectations make it harder to be open to what the world sends your way. I have read Erik the Pilgrims story about walking the Costa route and “laughed” at his complaints of the wind and sand. Now I understand– the wind blows constantly with no breaks – we walk one boardwalk after the other. 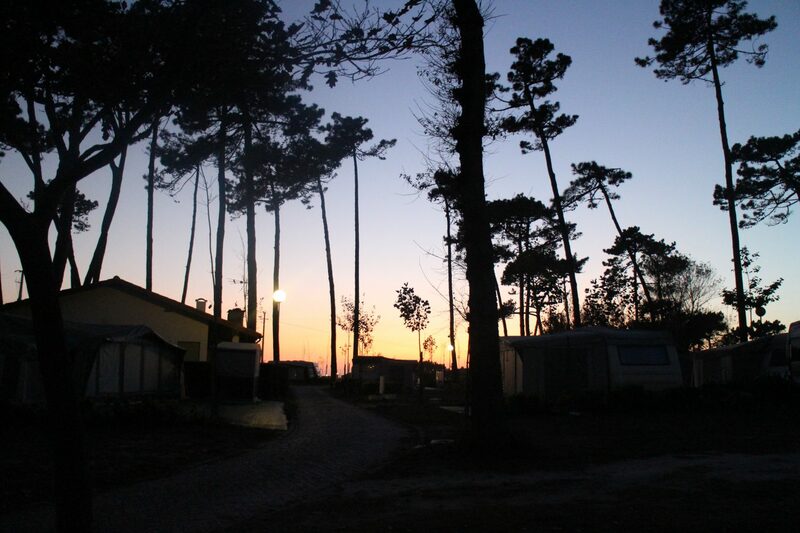 My Atlantic ocean ear was almost deafened by the time we arrived at Camping Orbitur. 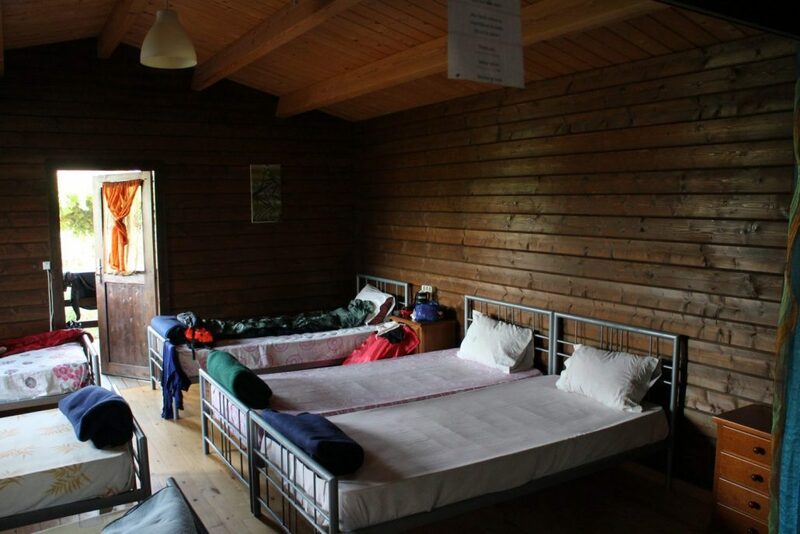 I seriously think I heard an angel sing when I opened the door to the camping site’s reception and was met by an overwhelming german host: “Aber was kommt dar? Gemüde pilgern! Herzlich wilkommen!! 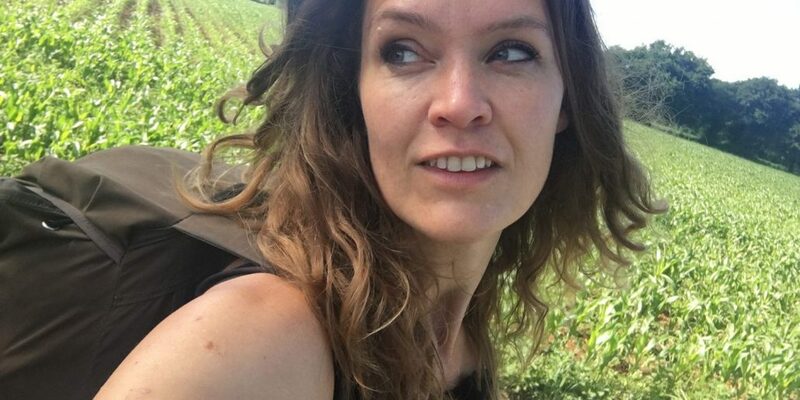 !” I exhaustedly sat down in the enormous sofa that wrapped around me and I promise you it was the most secure and cozy night we spent in our tiny hut under the stars and pine trees. Today awaits a route we don’t know much about. After several kilometers of yet more boardwalks in the sun and wind, we are ready to wave bye-bye to all that we know and to choose a new and less wandered route: the connector route between the Costa route and the central route, of which we don’t know much. Standing on this less treaded route reminded me of the time Torben and I met: we had three children each and wandered happily onto the “composition family route”. 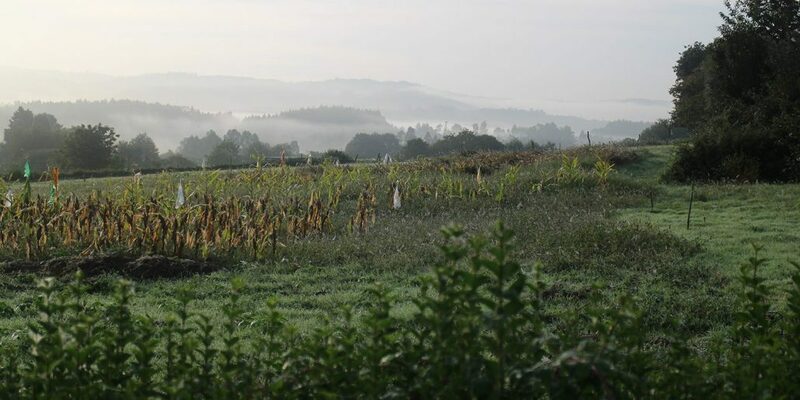 Here on the camino we instinctively do what we did then with our families: we research: Where have other people walked before us? What can we expect from the route? In Vila do Conde I see a German on the well-known yellow guide book. In it is a picture of today’s connector route… and we are off! 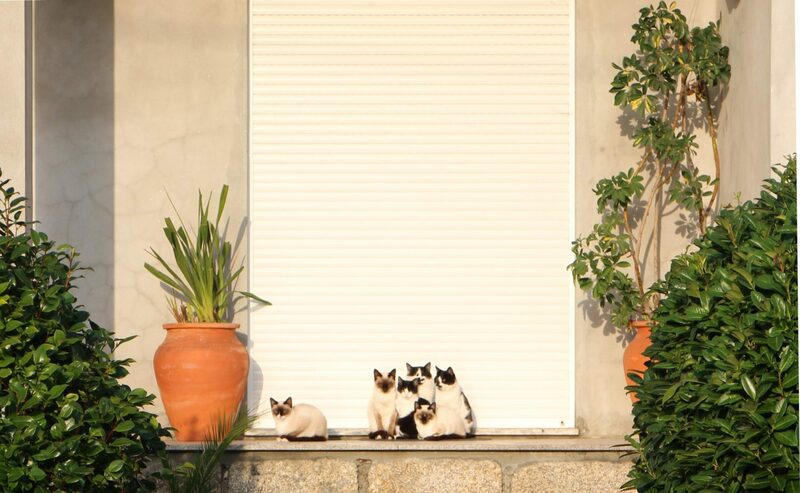 We find 5 cats basking in the sun and in each other’s company on some cool stone steps. Suddenly we see that there are 6 cats, not 5 – the last one has found a spot a bit farther from the pack … I wonder what that is about? I recall our task to unite two very different sibling groups in a new common family group with room for all our family structures, traditions, habits and relations. I am reminded of the importance of having everyone along on this mission. 1 + 5 united cats? Our evening ends at Antonio in a small part of Pedra Furada. He runs a small restaurant recommended by the Guide Michelin. Next to it he has accommodations for four in a small pilgrim’s room. This is our secure enclave and Chris and Dave’s (from Australia) too. Chris is exhausted and sleeps through the afternoon until morning. She lost her toe as a child and this causes her to lose her balance easily, a thing she works hard at keeping – her balance. Dave has carried her backpack and his own the last part of the route today. He did the same yesterday. 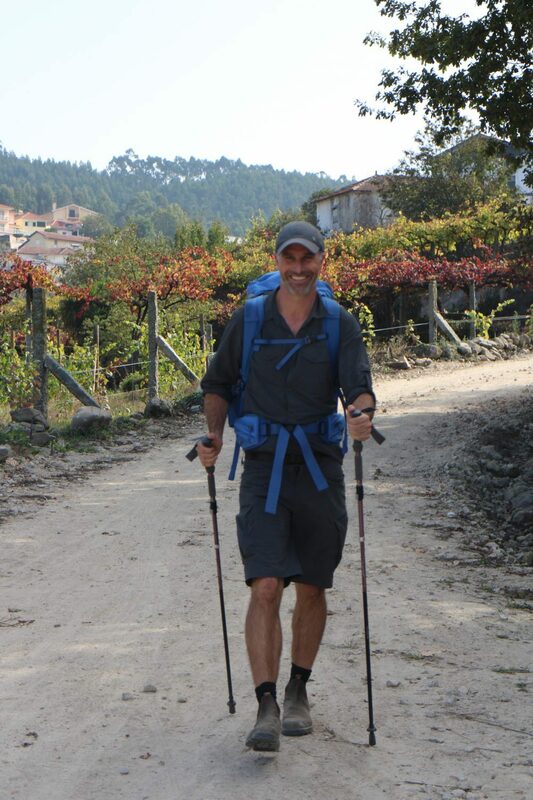 The Camino is his wife’s dream since her graduate years, and Dave is walking it with her and for her. It is amazing to see a man helping his companion by carrying her burden. The evening ends with us sharing a meal with Dave in the restaurant, which has (surprisingly) very fair prices. Dave is a charismatic man who describes his fruit farm very colorfully. As the evening passes, I realize that I have spent a whole evening listening. Usually I am Dave, I talk. I am not sure I want to be that any longer. There are so many amazing stories out there, if I could just keep quiet long enough to hear them. Maybe there is a reason for us having two ears and only ONE mouth. I have always seen our camino as me, the master, teaching Torben, the novice, the camino ways. 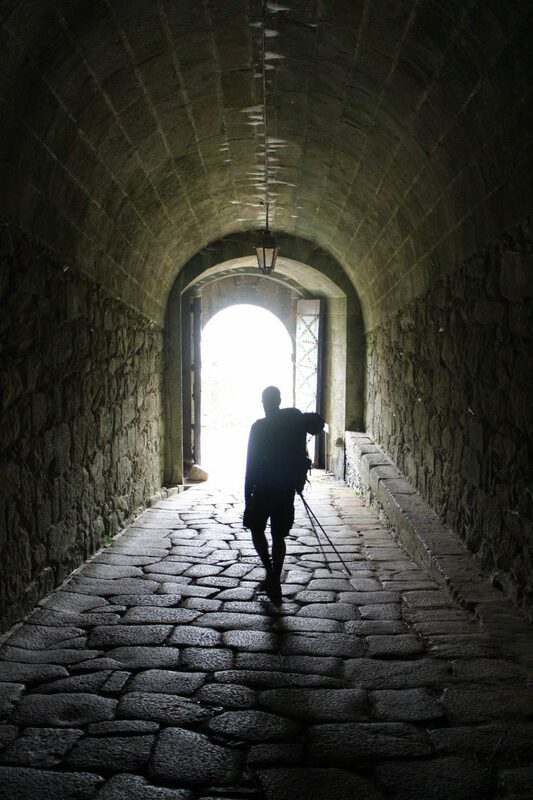 Well I use the past tense because little did I know, that when the camino’s reality hit me, like it did today, I would eat my words one by one! We are walking the long stretches of the Portuguese route with paved streets and cobblestones paths. I enjoy the view – but my feet feel like they have been pounded by a meat hammer. Later that afternoon I need an ETA (estimated time of arrival) and my pacifier, aka my mobile phone comes out. I have to – unwillingly – admit that this ETA causes more harm than good just like my other fixed expectations do. Google maps knows nothing of the camino routes! One minute there are 5.9 kms left, the next (2 kms later) its 6.2 kms! It becomes clearer and clearer to me that I limit myself with my expectations – and that I become the most irrational version of myself, when I don’t know what lays ahead. 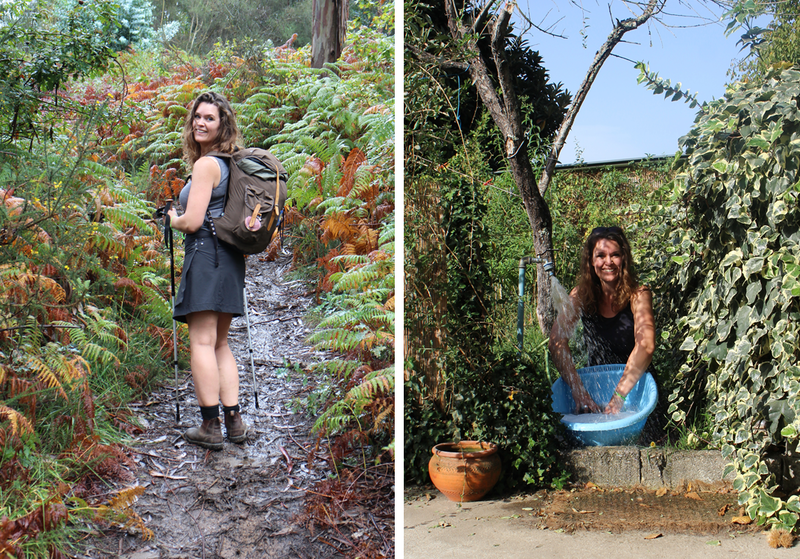 After kilometers of swearing and cursing we stand here: a small overgrown garden path leading up to Casa Fernanda. Fernanda lives here with her husband Jacinto and their daughter Mariana – along with a varying number of pilgrims throughout the year. The last two beds of the day are ours. 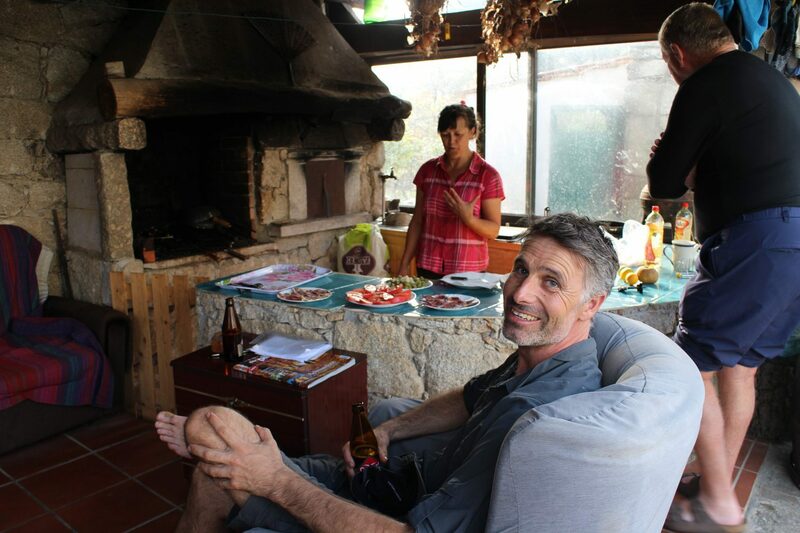 We sink, well-deserved, into the gardens low recliners – while Fernanda waits on us with tapas from her turquoise kitchen. Soft loungers and the smell of Fernandas tapas from our outdoors kitchen brings back our smiles. This family has dogs. Four crazy dogs and one of them is blind, but with help from the other dogs, it gets around. This makes me think of our “puppies” at home and what joy it brings me, when I see them helping each other out, when each in turn goes temporarily blind, as all teenagers do. I think of how important it is to have a family that has your back no matter what you are up against. An hour after our arrival two weary Dutch friends arrive. 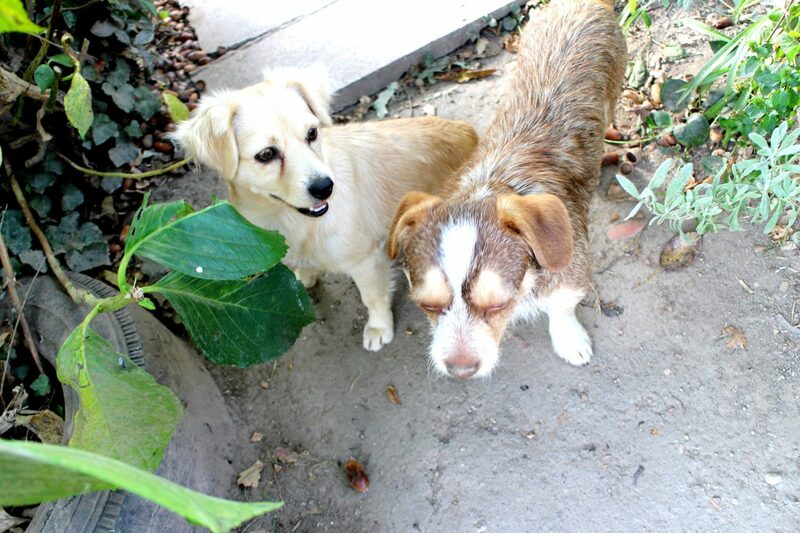 We give them our beds in return for a double bed outside in the middle of the garden. 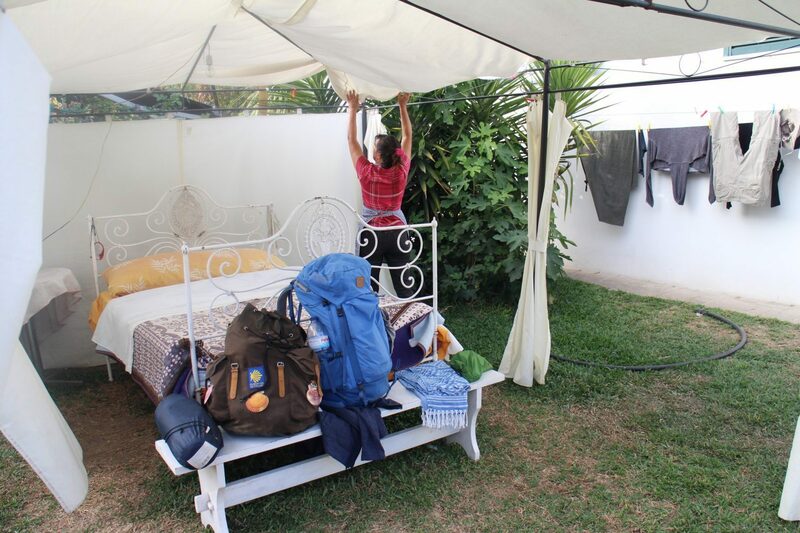 Fernanda sets the bed up with lights, covers, shelter and blankets. Fernanda has cooked us dinner in her own kitchen. She never walked a camino but her heart is that of a pilgrim and this sends shivers down my spine. It is as if every word hugs me as she sits at the end of the table talking: “The camino is all about love and about being grateful to life. Every step you take, take it for all the ones, who are not able to walk. 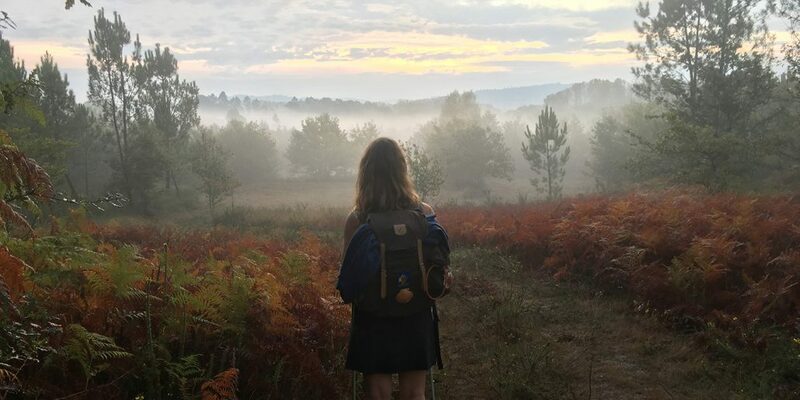 Be grateful that you are able to walk the camino. Put love in each step. That’s what it’s all about”. I feel it, it is right here where I live. Here thousands of kilometers from home, with my Portuguese family. Because… Home is where the heart is. What happens next, as far as I can remember, is something along the lines of Dutch humor, Portuguese port and songs from around the world. All of it driven by Jacinto’s contagious energy and eucalyptus shots. Believe it or not we end the evening with strainers on our heads, playing air guitar and using a broom as our mike on the disco dancefloor of the kitchen. I forget all about my battered feet, when we later that night creep into our garden bed. The rooster wakes us all at 5.30 AM. It’s a new day. We silently awake and find our way out into the darkness. The yellow arrows are still sleeping and we concentrate our senses on finding our route. This makes me think of what attention really does, and I get to this: when you shut something down, like one of our 5 senses, you make room to focus on something else. The other senses take over and share the excess energy vacated by the last one. But we are still none the wiser! Suddenly we are lost. We tread back until we reach the last yellow arrow and the mystery is resolved. The street lights came on right here, disrupting our focus and bling – we were lost. A really important acknowledgement, at home too: what steals my attention? And what are the consequences of allowing random “street lights” to distract me? We know the route today – something about an incline. We can’t see it. We don’t know where nor when we will reach it. But we know it is out there. The mountain fills our conscience and it is as if the incline grows and grows as we walk. It is as if the worry increases with every corner and we speculate but sigh with relief as one flat surface after the other comes into view. It is only 7 kilometers before Rubiäes that we stand at the foot of the incline. No one told us about the beauty of this Barbapappa-like shaped mountain. Rock formations are spread across the woods making a whimsical path and awakening so harmoniously the child and mountain goat in me. The day reminds me of Mark Twain’s famous words: “I’ve had a lot of worries in my life, most of which never happened”. The mountain today is a worry I could’ve been without as it was no worry. Maybe I should look at some of the other mountains around me, and see which ones are really worth worrying about. Pure love: the man’s woolen socks are hand washed today. The Dutch friends arrive to tonight’s restaurant and we share another fun pilgrim’s meal. 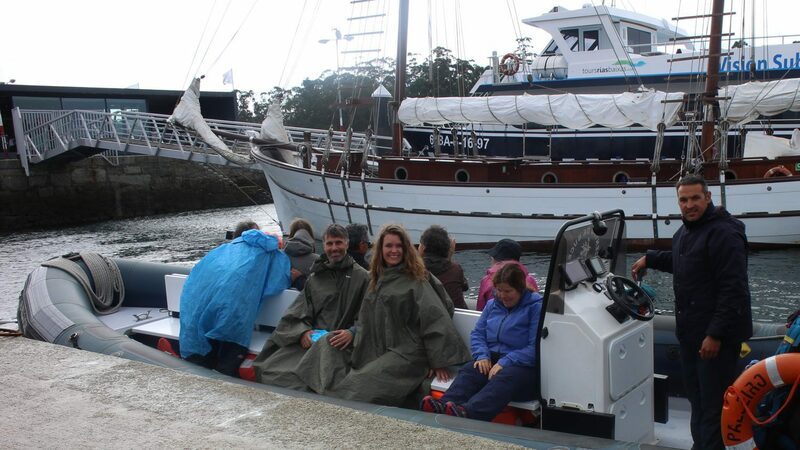 Our intimacy along the camino amazes me. We are two here – a team. 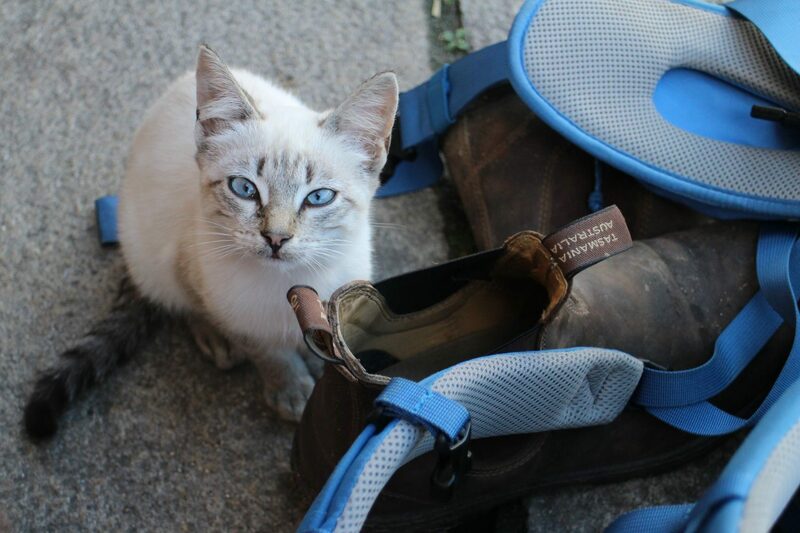 From day 1 it has been clear that the camino has won Torben’s heart, just as I had hoped. Every day we choose a new subject to discuss – today it is our relationship. Being on the road together – opens up new areas for conversations – brings back memories from our experiences together, the good ones and the bad ones. 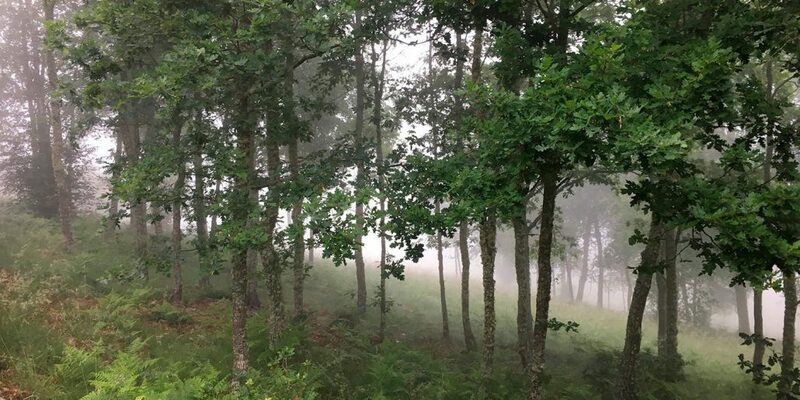 We can’t avoid discussing an old issue – why I chose to go on the Camino Primitivo alone last year? Why did I choose my “I” when our “we” was an option and we both love trekking? Talking about tough matters seems easier here. It is as if all the senses around us washes away our burdens in our souls. Deep in conversation we reach Valenca – the city before we cross into Spain. As we walk through this unknown city we find a wall with a tunnel in it. A detour, yes, but we take it. The wall is around a meter thick and we quickly realize that it is part of a giant fortification that we have found a small passage through. It surrounds the heart of the city – friendly, special, coiled and charming. The contrast is not to be missed – as tough as stone on the outside as soft and loving on the inside. I think back on all our defense mechanisms that we brought to our relationship. How inflexible we have been about defending our own hordes. Our own family traditions and cultures. Our own choices no matter how stupid we knew they were. I am happy to remember all the solutions we found by working together. All the times that we have dared be open in our minds and especially for all that we are here. Together. Now. 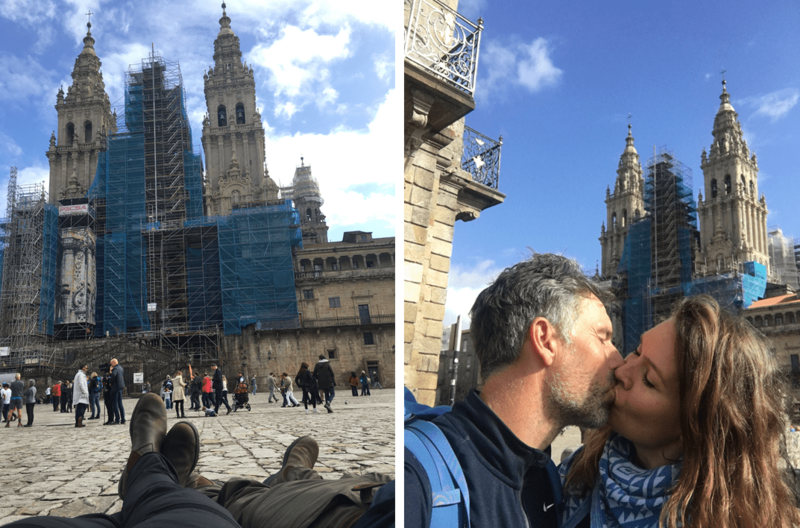 There are several ways of being a couple on the camino. In the morning darkness we meet the Dutch friends again. One speedily and sweating walking up front, and the other striding with long calm steps, hat on and flashlight aimed straight ahead allowing us all to walk safely in its light. The two friends are clearly not in sync. 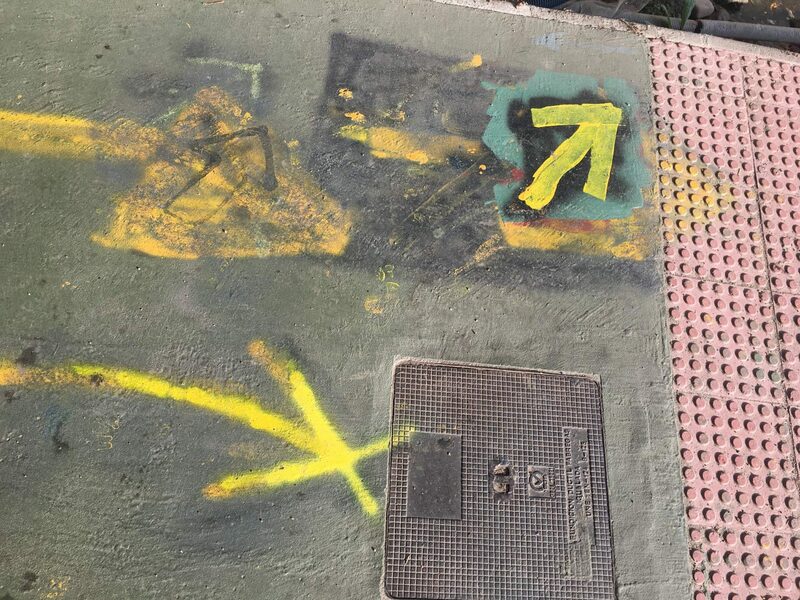 Shortly before O Porriño we pass a sidewalk with a bitter dispute over directions: yellow arrow painted over with black paint painted over with another yellow arrow. The middle east of marks. Layer upon layer of conflict as to which direction the camino should go. Should it go along the long river in the woods, or through the city and benefit its people? Had the two parties asked what the intention of the other was, maybe this conflict could’ve ended with pilgrims having two different choices. I wonder if it isn’t the same with marriages and other disputes? We are so busy proving ourselves right, that we don’t take the time to ask what the other’s intention is. We lose focus and don’t see the possibility of compromise and end up forgetting our common aim. We meet our Dutch friends here for the last time. They have split up. One swiftly walking away. Alone. The other enjoying his coffee. Alone. Today’s stage ends in Redondela where we have been recommended a private Albergue with a double room. It turns out not be a double room after all. The room lays adjacent and open to a small dormitory and a walkway, only separated by a thin curtain. The other pilgrims have to walk through our room to hang their clothes up for drying. At first the place looks nice: organic fruits, compostellas on the walls and an old bike. Two Finnish women come over completely out of it and it turns out that it was a neighboring albergue they originally had booked. 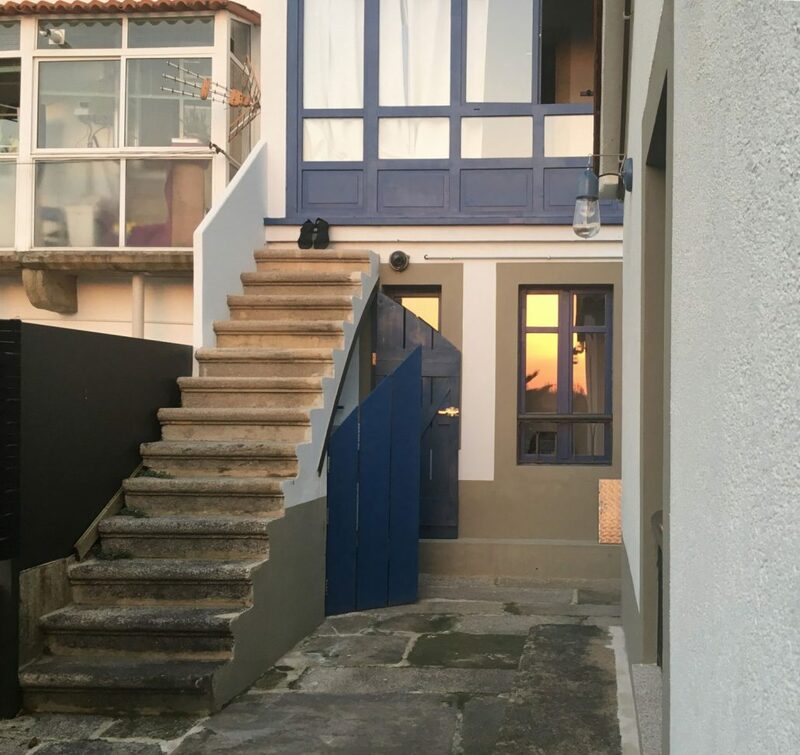 They feel hijacked to the wrong albergue when they arrived and a huge fight breaks out between the two albergue owners, as it turns out that we are staying with a woman who makes a living by stealing customers from the other albergue. The Finnish women end up having to pay 6 EUROs for the bath they have taken. Clearly Torben is bothered by this hubbub and goes quiet. The atmosphere turns even more sour while we cook, because the hostess several times corrects us. Suddenly we see the video cameras in the living room, and the prices of everything from lemons to beer. And that is it for me – I snap. I am ready to read all the recommendations on accomodation for the next days. I just don’t want to have to book another bad experience again. Suddenly I feel like a tour guide who is being chided for one unlucky booking, whilst all the good bookings are swiftly forgotten. I stress and snap at my husband and am unfair in every way. My body and soul seethe when I go to bed. And I feel sorry for myself. We can’t seem to get away from Redondela fast enough this morning. It is the bad energy of the albergue we need to put behind us. We are in our own bubbles and inside mine I dwell and fume with feelings that seem to have taken over me. When I look back I can see that I had nothing to do with the conflict at hand: Some pilgrims are arguing with the hostess, who in turn is arguing with her neighbor. My husband reacts to this and turns silent – I react to his reaction and BOOM… a strange funky tasting conundrum of feelings is born, with no inkling of surplus. An interesting thought though: do I really want my peace of mind to be in the hands of other people? Suddenly I see that there is a meaning behind all this: I must have been put opposite this particular hostess for me to learn which situations and moods I should take in and which I shouldn’t. Maybe yesterday’s conflict could motivate me to keep my mood access keys to myself. It seems that Redondela must be walked away, so after the first 22 kms to Pontevedra, we still seem to have a tank full of energy to spend. We stand still for a long time, maybe an hour, at the intersection between the central route and the Variante Espiritual. We are both the youngest of four in our sibling group, so taking a decision is a nightmare. We keep waiting for the other to take the lead. We laugh, make fun of and joke about the other being indecisive. After a long time deliberating and still very much in doubt, we turn left and walk down the unknown and longer path of Variante Espiritual. Taking an adventure like this together and feeling that this was a decision we made together motivates us. We glide through the path and the music between us is sweet again – just like the Siamese kitten we meet at the pier while we drink a cold glass of white wine in the fishing town of Combarro. 34 kms escaping from the inn has cost me a blister on my toe. I puncture it and let the sea water take care of the rest. Ecstatic from the wine and our good mood, we decide to put the pedal to the metal and walk the last 10 kms to the albergue in Armenteira. However, no one told us about the mountain on the path with an incline of 440 m on this last third of the walk. Exhausted we arrive at Armenteira after walking today’s “death route”. 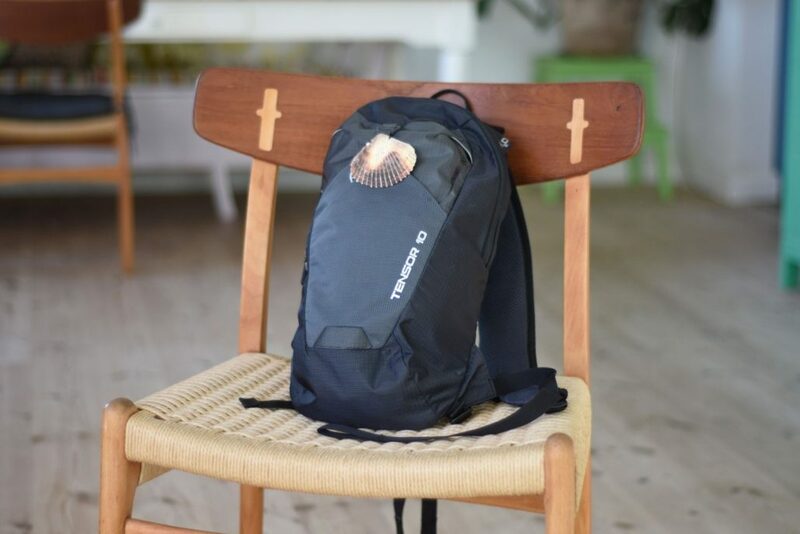 Torben opens his backpack and I find that he has been carrying more than just my bad mood, cause out comes a bottle of champagne that I accept a bit embarrassed. I salute my patient 2-cylindered motor man. Today gives a pretty good picture of what our life together looks like: we have both said goodbye to the established normal life and taken the more adventurous route of “variante”: a family put together with 6 children. Courageous and very much in love we threw ourselves into the unknown and had the family puzzle work out with many more pieces than expected. Now that we are here, we can exhale and enjoy. We share the champagne with a German pilgrim, who is almost as wide as she is tall and my first prejudice emerges: “must be hard to walk the camino”. But she turns out to be much tougher than I thought. 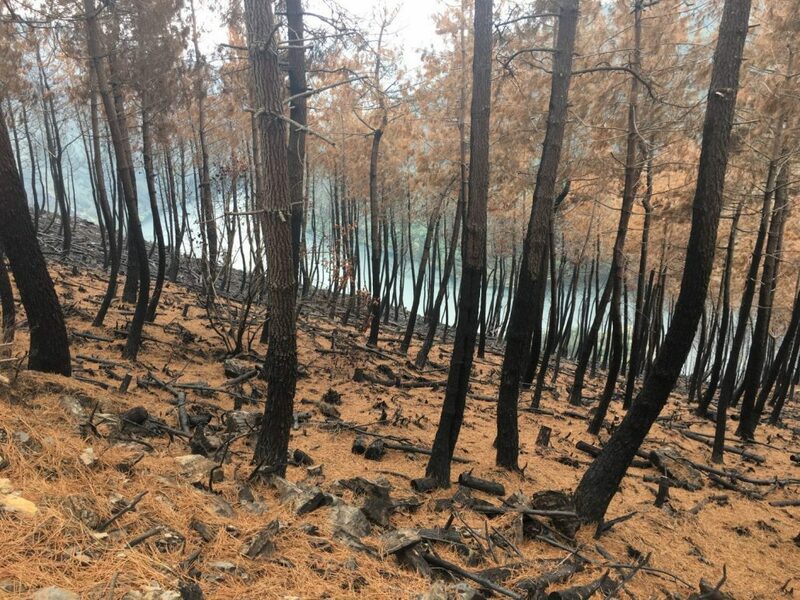 She has been on the run on the Camino, just like us: she has walked over 50 kms in smoke and ashes, surrounded on both sides with fire as she walked near by one of the over 100 forest fires the authorities are working hard to control. She needs this champagne. And time will show that we need her. When we decided for the extra adventure on Espiritual we unfortunately did not have an extra day to add to our schedule. This means we have to do two stages today: The 24 kms walk from Armenteria to Vilanova and the boat trip to from Vilanova to Pontecesures as well. It turns out today’s only boat leaves at 1PM, so we have to start walking very early in the morning. This means a trek with the first 3 hours being in total darkness, as it is the month of October and the sun is not up yet. Our German pilgrim friend is the only other pilgrim at the albergue with the same plan. We agree to walk together, the three of us, at 6AM – she has a light, we don’t. The little chubby body I was biased towards yesterday walks in front of me for the whole 3 hours. Never have I seen such a tactful, well trained and determined person jump from boulder to boulder. Up and down, in and out along the route of, what (had there been light) was the Camino Portuguese’s most beautiful route winding through forests and along a small river. Against all odds I find myself struggling to keep up and to keep an overview. The route has no signs and no arrows, and many places it is very clear that had we been alone mapping this route without our German pilgrim, we wouldn’t have made it on time. Her decisiveness and arguments led us safe and sound to the pier. Our tracker shows 29kms and not 24 kms as promised when we reach the boat with only 30 mins to spare. Thank you, camino, for confronting me with my prejudices. And thank you Torben for taking my hand during our walk in the dark and passing me a piece of dark chocolate when you silently knew my energy levels were dropping. We walk through Santiago hand in hand and lay down in front of the cathedral. In this peaceful place, where the stories, struggles and dreams of thousands of pilgrims are interwoven. A camino is a gift of love. GUIDE Is it a good idea to bring a teenager on the camino? 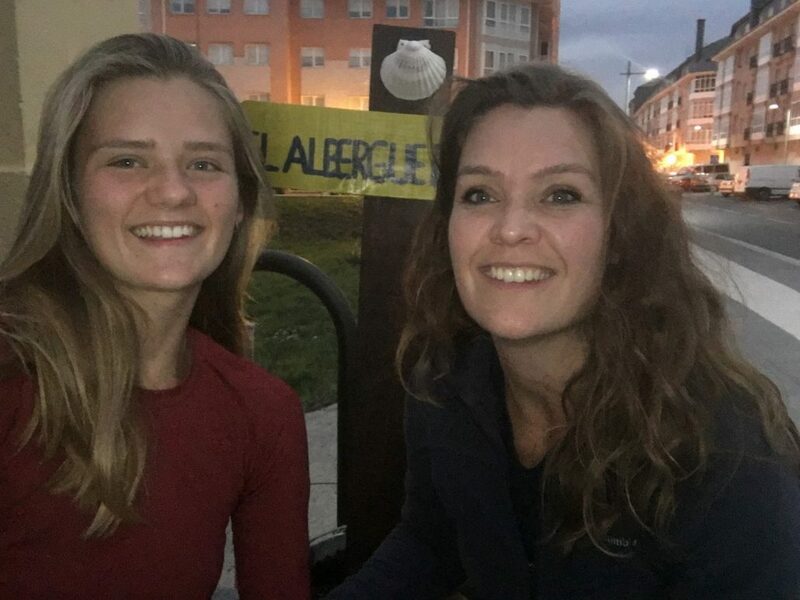 http://www.friefodspor.dk/wp-content/uploads/2018/12/teenager-the-camino-El-Albergue-de-Delia-Sigüeiro-camino-ingles.jpg 1125 1500 Marie http://www.friefodspor.dk/wp-content/uploads/2018/04/FF-logo-400_5.png Marie2018-12-19 12:41:072019-02-06 14:27:05GUIDE Is it a good idea to bring a teenager on the camino? 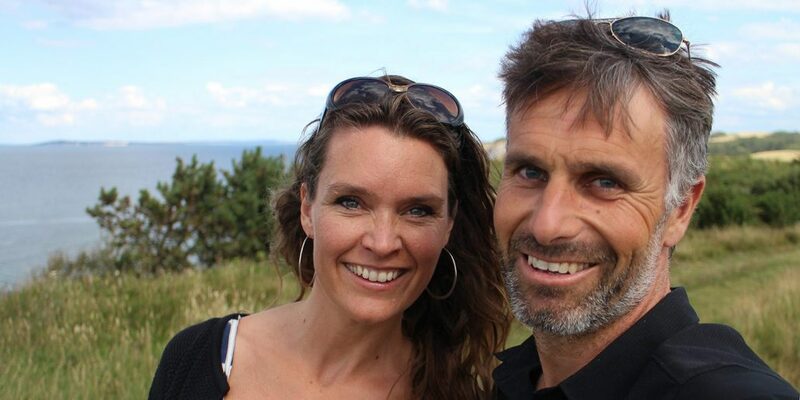 ABOUT Who is Marie and Torben? http://www.friefodspor.dk/wp-content/uploads/2018/12/About-us-marie-lau-florin-torben-lau-florin.jpg 750 1500 Marie http://www.friefodspor.dk/wp-content/uploads/2018/04/FF-logo-400_5.png Marie2018-12-01 21:42:312018-12-19 14:38:43ABOUT Who is Marie and Torben?